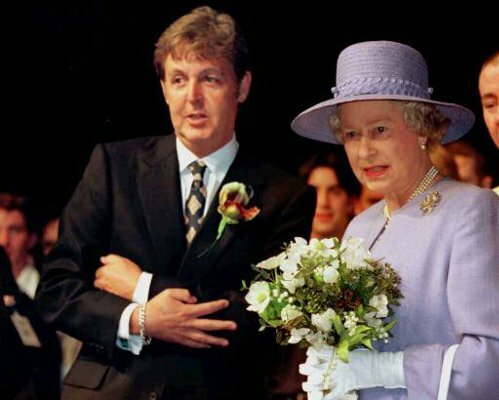 On this day in 1997, Paul McCartney, a former member of the most successful rock band in history, The Beatles, was knighted by Queen Elizabeth II for his “services to music.” The 54-year-old lad from Liverpool became Sir Paul in a centuries-old ceremony of pomp and solemnity at Buckingham Palace in central London. Fans waited outside in a scene reminiscent of Beatlemania of the 1960s. Crowds screamed as McCartney swept through the gates in his chauffeur-driven limousine and he answered with a thumbs-up. McCartney’s wife, Linda, who was fighting breast cancer, did not accompany him, but three of their four children were at the palace. “I would have loved the whole family to be here, but when we heard there were only three tickets, we had to draw straws,” McCartney said. Linda McCartney would succumb to cancer 13 months later on April 17, 1998. As for the surviving Beatles, Ringo Starr and George Harrison, Sir Paul said that since they learned that he would be knighted, “They call me ‘Your Holiness. '” McCartney dedicated his knighthood to fellow Beatles George Harrison, Ringo Starr and John Lennon and the people of the northwestern port of Liverpool. In October 1965, McCartney, along with fellow band members John Lennon, George Harrison and Ringo Starr, collected MBE (Member of the British Empire) medals, much to the shock of the British establishment. Lennon, who returned his MBE in 1969 as a war protest, was assassinated in New York in 1980. Harrison would also succumb to cancer, passing away on November 29, 2001. McCartney admitted he was very nervous before the ceremony but said it had been a great experience. “Proud to be British, wonderful day and it’s a long way from a little terrace (street) in Liverpool,” he told reporters. Aides said he won’t be calling himself “Sir Paul,” the title conferred when the queen tapped him on each shoulder with a naked sword as he knelt on the investiture stool. McCartney’s knighthood was considered long overdue even by the conservative standards used in Britain, which sees most such honors going to judges, scientists and politicians. 2009 Toyota sells 1 millionth hybrid in U.S.